I’m always very attracted towards skincare products containing milk, probably due to the picture in my head of the famous ancient Cleopatra bathing in milk for her beautifying rituals. The Cellnco Anti Pollution Refreshing Milk Sleeping Mask Ampoule was very interesting in several points: first of all, I haven’t used any products from this Korean beauty brand yet, second because of the milk protein ingredient, and lastly, because it is a sleeping mask and I love using sleeping masks! Thanks to Beautytap.com for providing me with this product for reviewing. Cellnco is a Korean brand which might be very new and unknown to many people. The concept of the brand is tackling pollution-related premature aging of the skin. The brand produced products for famous brands like Estée Lauder, Lancôme, and Skyn Iceland for 15 years before they started their own cosmetics brand. The brand is also one of the brands focussing on botanical extracts and being free from harmful chemicals. 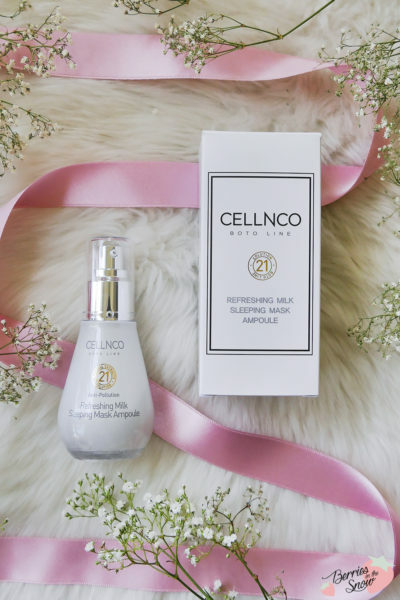 The Cellnco Anti Pollution Refreshing Milk Sleeping Mask Ampoule is one of five antioxidant-rich ampoules of their skincare range. It’s a sleeping mask ampoule promoting skin repair during night-time featuring milk protein as the key ingredient. As we all know, our skin is most active during sleeping and the body and also our skin is regenerating during this time. Any skincare applied on our skin during sleeping will be absorbed more thoroughly and be more beneficial. Milk protein is the key ingredient of the Cellnco Anti Pollution Refreshing Milk Sleeping Mask Ampoule as the name already suggests. Hydrolyzed milk protein, which is usually used in skincare, has a complete amino acid content and is therefore very nourishing. Also, it is very low in toxins, which makes it perfect for dry and sensitive skin types. The protein has healing, repairing, and restructuring properties for body and hair. 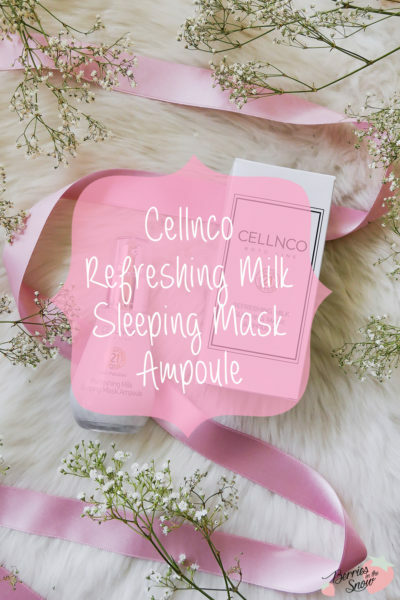 Cellnco Anti Pollution Refreshing Milk Sleeping Mask Ampoule is a sleeping mask and thus it is used best for your night-time skincare regimen. The product is paraben-free, sulfate-free, alcohol-free, silicon-free, and EU-allergen-free. The full ingredients are listed on SkinCarisma and you can check for them >>here<<. You can already spot all the botanical extracts in the list, eg. ginseng, chamomille, rice, lavender, rosemary, camellia… but also moisturizing ingredients like hyaluronic acid or glycerin, and even honey extract! 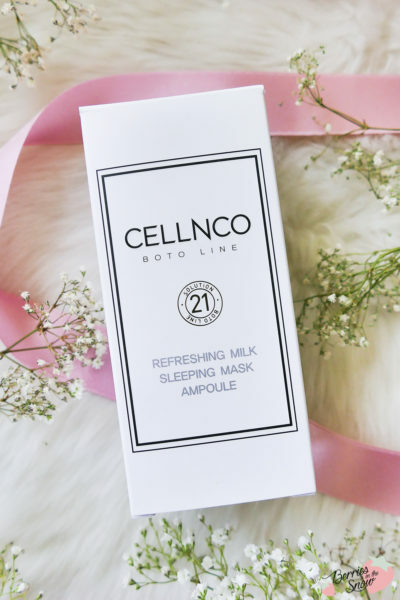 The Cellnco Anti Pollution Refreshing Milk Sleeping Mask Ampoule has a firm gel texture and white color. you only need a little for your face as it melts and distributes nicely upon application. Despite the firm gel texture it is very lightweight once applied and leaves a refreshing and moist feeling. Also, this sleeping mask ampoule is not sticky or heavy like other sleeping masks. It’s no problem to use another night cream on top of it. This Sleeping Mask Ampoule absorbs very quickly and leaves really no trace, simply a very pleasant and refreshing scent. I can imagine that people who do not like heaviness or films, especially not during nights, will love this sleeping mask ampoule because it doesn’t leave your skin with a trace. I have this ampoule at my bed-side and usually, on lazy nights when I only manage to take of makeup this is the only product I use additionally. 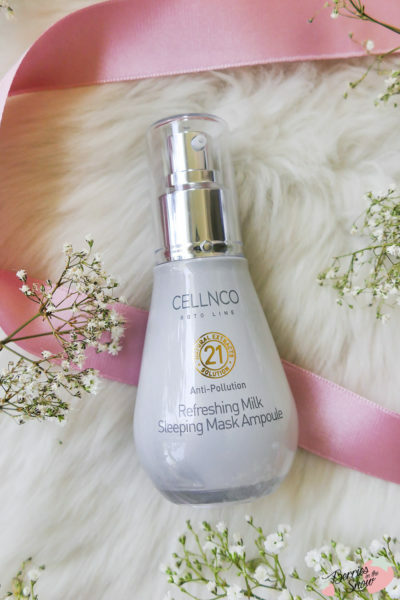 The Cellnco Anti Pollution Refreshing Milk Sleeping Mask Ampoule retails for 28 US$ on Beautytap. You can use the code berries15 for 15% off non-sale items! Have you tried products from the brand Cellnco? What are your thoughts on sleeping masks? That’s so cool that this brand actually developed products for major brands before launching their own products, definitely makes me feel more confident that they know what they’re doing! 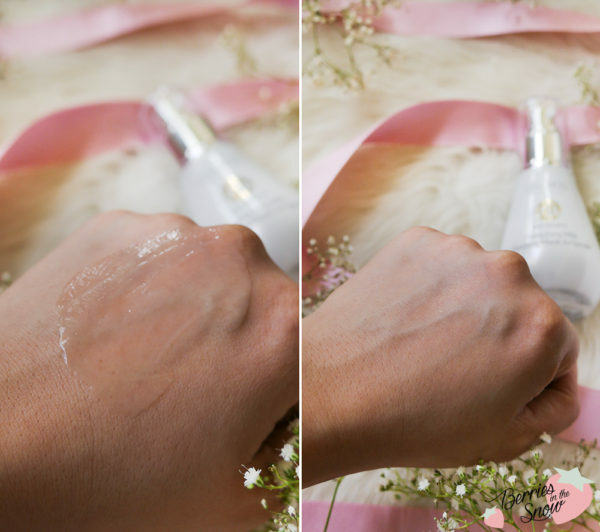 The ingredients in this ampoule looks lovely, and I can see myself really enjoying this!